Here's a fairly quick holiday card. These stamps all come the Cat's Pajamas Elegant Christmas set. I thought that the swirled pattern would pair nicely with the patterns in the Ski Slope paper. 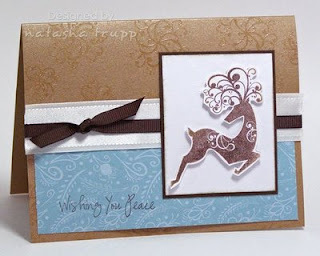 I had already picked a brown, white, and metallic theme, which I was quite happy with, but that touch of Baja Breeze really livened up the whole card. I had the reindeer only stamped once, but it seemed too flat, so I stamped a second image, cut it out and placed over the first with pop dots. I finally made time to use some of my latest acquisitions. I had been eyeing this birthday set for quite some time and finally picked it up when it was on sale last month. 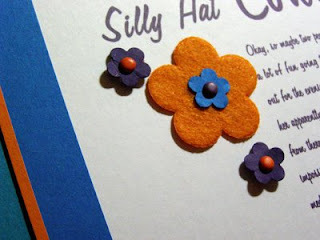 I used the Hawaii Papaya patterned paper as my colour inspiration. It's a pretty standard layout, but I was on a square kick tonight, so that was a slight change. 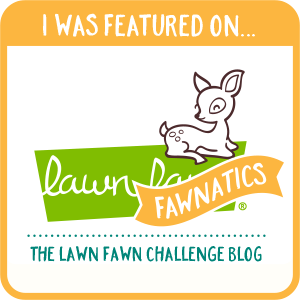 Hmm, what an appetizing title that is, however the colours are quite appealing together! That's right it's time for another KWernerDesign Colour Challenge. I liked this subtle mix of greens and neutrals. Sahara Sand is a highly neglected neutral in my papers. I tend to grab kraft instead, but it's a nice colour! Onto the card! I've been fiddling with parts of this card since 10:30 this morning. I really wanted to make glitter letters. For the first batch I used green glitter and sticky tape, with a celery backing. Well, that wasn't a very good colour match. Next, I decided on celery cardstock, a bit of mod podge and clear glitter. Then I left my table for a while, took the cat out (so she could realize again that winter has arrived), had lunch, tidied up my craft table (and didn't misplace my letters, amazingly! ), then finally come back to the project. I found that the celery letters contrasted best on the olive background. 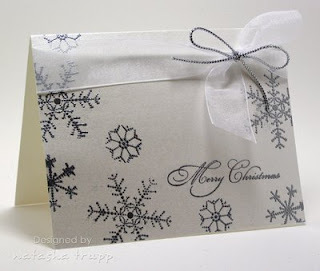 Next I wanted to bring in some embossing and polka dots. 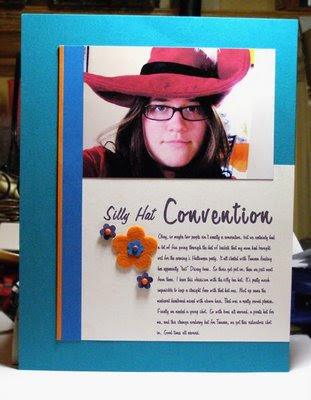 I decided on a layout, found this cute chipboard flower that I customized, added a bit of ribbon and a button to the card, and 3.5 hours later I was finally done! I quite like how it turned out. At first I was going to have it only say "friend", but that seemed a tad stupid. 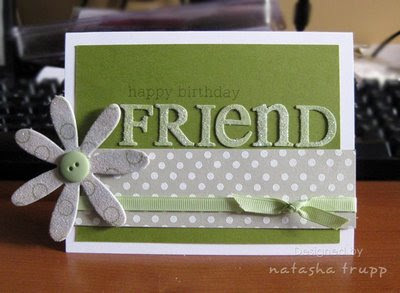 All my friends know they are my friends, why announce it on a card? So I tagged on happy birthday in front of it. Since this was a Verve event, I decided to get out all my Verve stamps and give them a little lovin'. You know how it is sometimes, you get in a bit of a rut of always reaching for the same types of stamps and you neglect all that other amazing stuff you have. Before I started, I actually did a little bit of planning. I assessed each sketch and wrote down which Verve images I thought would work out best for each sketch. I even stuck to that. The colours and minor details just kind of fell into place along the way. For this first card (which is actually the second sketch), I had decided on using Filigree Fantasy Filigree Fantasy. It's such an elegant set, so I decided to do a bit of copper embossing, especially since I have this gorgeous copper paper to match. Well that worked nicely, but then I was a bit stuck on what colour to pair it with. I went through my SU! patterned paper stash and came across Apple Cider. While it obviously doesn't have copper in it, it does have Really Rust. That rust goes fairly nicely with River Rock. So that's how I came about this semi-unusual colour combo! I was in the mood for colouring this afternoon, and with the snow from last night, it only seemed appropriate to make it a Christmas card. 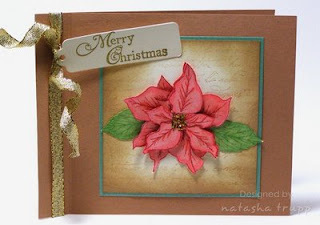 I stamped the poinsettia (from a year in flowers) and the leaves twice, cut them out, then coloured them. I only cut out part of the second flower to get a cooler layered effect. I added a bit of stickles, then applied gold glitter overtop (originally I had used cinnamon stickles, but I decided I wanted a bit more gold). For the background I stamped French Script in a once stamped off Creamy Caramel, then sponged all around the edges. 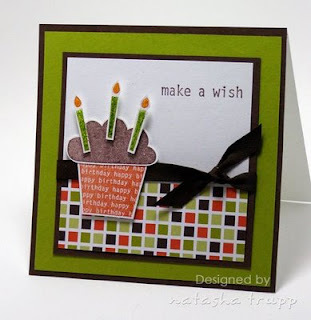 Next up, I used my mini Scor-it (seriously love that tool, I use it for ALL my cards now!). I don't recall what this type of fold is called, but basically, I scored 3/4'' in from the center fold. That gets glued together, then you have a bit more of a square canvas to work with. 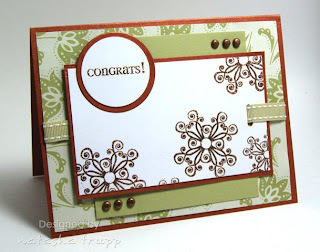 Finally, I stamped and embossed the sentiment on vanilla, then cut it out with a tag die. That got tied onto this funky 40% metallic ribbon I found in my stash. 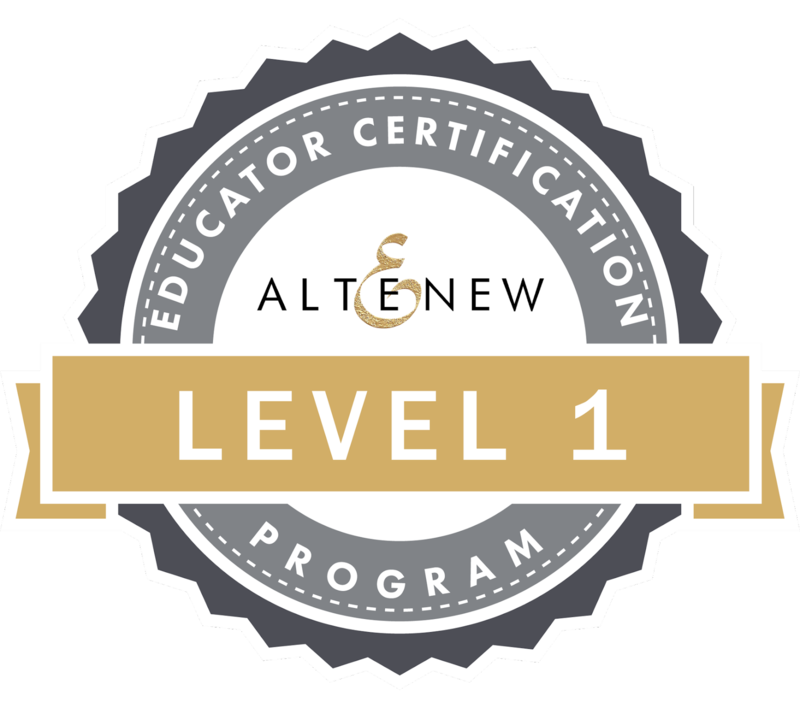 It's like wire edged ribbon, without the edge. It's pretty neat stuff, very flexible, but it keeps its shape. For the curled edges, I simply wrapped it around a pencil. I quite like how it came together, considering it started out with the desire to colour something. Irene has done it again! The latest DoodleFactory release is AMAZING. I think my favorite image is Coco the polar bear, too cute. You have a chance to win the stamps here (click link :D ). Or if you'd rather not risk it, you can always purchase them, they start shipping next week some time. The matching sentiments are free when you buy the full unmounted sheet. That offer is good until Christmas! 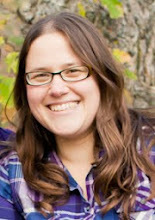 As I mentioned before, I am currently enrolled in an online scrapbook class. 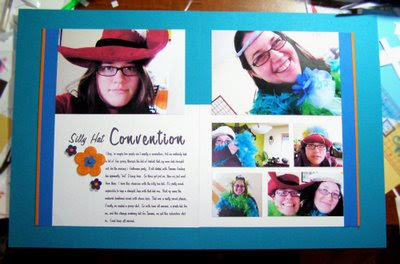 ( Design Your Life at Big Picture Scrapbooking) It's been really awesome so far. I've been doing the assignments in digital format, paper format, and sometimes hybrid. The new assignments come out on Thursdays, so I was inspired to make a layout.This week's theme is Unity. I had my pictures all chosen, my journaling all printed out, and then it hit me. The latest KWD colour challenge was perfect for my layout, most of the colours or ones of similar tones could be found in my photographs! If you want to read the journaling: "Okay, so maybe two people isn’t exactly a convention, but we certainly had a lot of fun going through the baskets of hats that my mom had brought out for the evening’s Halloween party. It all started with Tamara finding her apparently “lost” Disney boas. So those got put on, then we just went from there. I have this obsession with the silly bee hat. It’s pretty much impossible to keep a straight face with that hat one. Next up came the medieval headband mixed with clown hair. That was a really crowd pleaser. Finally we needed a group shot. So with boas all around, a pirate hat for me, and this strange corduroy hat for Tamara, we got this ridiculous shot in. Good times all around." My photography of 2 page layouts is less than awesome. I kept the page pretty simple, like my cards. But here's a close-up of my flower cluster . I finally picked up some stamps from Gina K. These ones were designed by Rupa Shevde. I love her clean, detailed, graphic line designs. I've been wanting this set since it first came out, but I just kept putting it off. 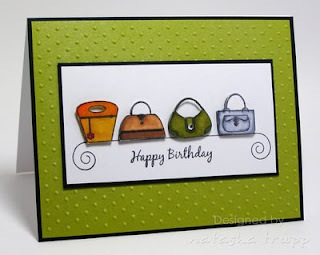 I needed to design a birthday card for my mom's boss, I thought that these purses seemed perfect for her. 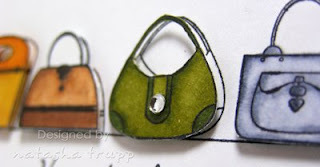 I coloured them in with Copics, then cut them out, popped them over another stamped image, and added a bit of bling to the olive coloured purse. I was going to make the card in really bright tones, but it just didn't seem right. I'm glad I settled on earthy tones, it just seemed more appropriate for the recipient. To add that little extra something, I applied the Swiss Dot folder to some Kiwi cardstock then sprayed a shimmer spray. And just so you can see the effect of the popped up purses, here's a close-up. This week's CPS sketch is sponsored by Starving Artistamps, so the design team decided to play along! Here's my take on the sketch. I decided on images first, chose my marker colours, then found cardstock to match. 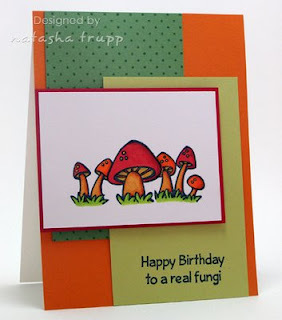 I just love these mushrooms from the Fairy Tale sheet. I used various Copics to colour them in, added a red mat, then stamped some of my own patterned paper using the Dot background. I decided to let the mushrooms star in the image panel, since I was pairing them with the punny "fungi" sentiment.